Table 1. The following table shows 11 counties with a 3-year average of the annual mean PM2.5 for each year below the established standard. The first column lists the county; the second lists the average value for that county. Some entries have an additional comment indicating the design value given is based on incomplete data. Table 2. 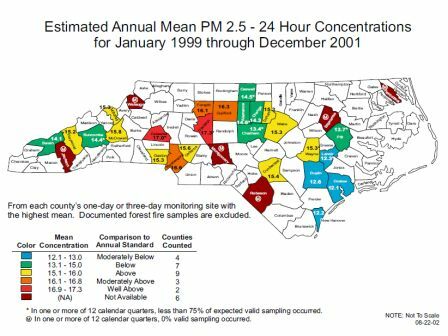 The following table shows 14 counties with a 3-year average of the annual mean PM2.5 for each year above the established standard. The first column lists the county; the second lists the average value for that county. Some entries have an additional comment indicating the design value given is based on incomplete data. Note: Nonattainment designations may not follow county boundaries and will be based on later data than are shown in this table. Table 3. The following table shows 6 counties that were monitored in 2001 but did not have enough historical data to calculate a valid 3-year average of the annual mean PM2.5 that could be compared to the established standard.